SpaceTheremin is a virtual mouse-controlled theremin. Unlike a standard analog theremin, which typically has a sinewave oscillator and some basic vibrato, SpaceTheremin lets you choose from six different oscillator types (sine, square, triangle, sinc, saw, and pulse). The same waveforms can also be used for vibrato. It has an adjustable pitch range and checkboxes that let you select whether the pitch and volume ranges are logarithmic or linear. Another neat trick is to use the tab and arrow keys to adjust parameters while playing tones with the mouse. For instance, if the waveform is selected, the arrow keys will change waveforms in mid-tone for an interesting effect. You can also do the same with the vibrato waveform. Adjusting the vibrato frequency via the keyboard can also be handy. This program is more for generating strange sounds than for playing actual music. As such, you may get some really horrible noises out of it. We would be incredibly impressed if anyone managed to play a tune with it, even if it were something as simple as "twinkle twinkle little bat". System requirements are minimal. If you can run Windows XP or newer and are able to listen to sound, you most likely meet the requirements. It probably will not run well on anything older than a Pentium 3. It was written using wxWidgets and uses PortAudio for its sound output. SpaceTheremin version 1.0 used OpenAL and has a raw, gritty, overdriven sound when the volume is increased. This is due to a math error that results in digital clipping at higher volumes. The distorted sound may be more desirable for some uses. SpaceTheremin version 1.1 uses PortAudio and has a smoother sound without the overdriven signal distortion. The clean sound may be more desirable for some uses. SpaceTheremin is freeware and may be distributed freely. The source code to SpaceThermin is available on GitHub under the MIT license. Switched sound generation from OpenAL to PortAudio because OpenAL doesn't work well on Windows 10. 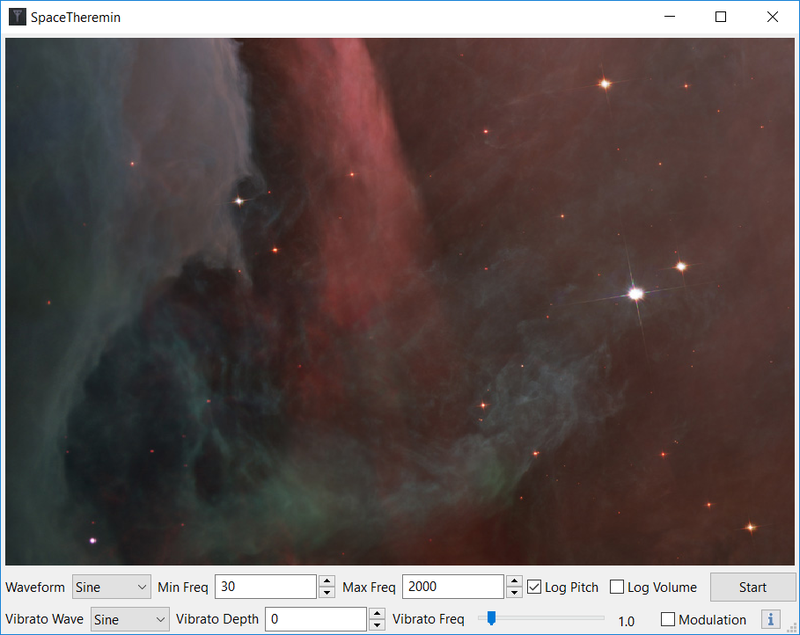 The vibrato frequency slider will now grow larger when you enlarge the window to make it easier to scroll to exact values. The first version of SpaceTheremin won an Editor's Choice award from Hitsquad. That was a long time ago, on February 7, 2007. SpaceTheremin has had more than 70000 downloads.